NEW for 2017--Hot Rod Sled Shop Clutch alignment tool for 2008-17 Ski-doo XP, XS, XM, & REV GEN4 850 Chassis sleds with TRA or PDrive primary and QRS Secondary clutch. This tool is designed with the best offset we have found for lowest clutch sheave temperatures and proper jackshaft alignment. 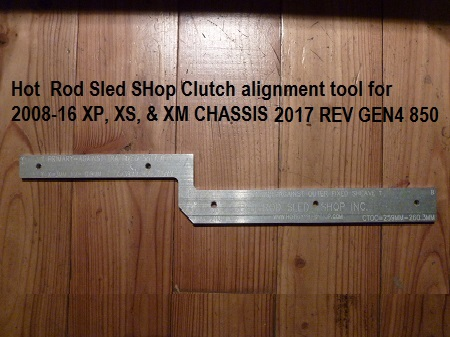 Most 2008-2016 Xp & XS sleds require our QRS shim kit to properly align the clutches. The REV GEN4 chassis may have enough motor adjustment to align without a shim kit. The QRS shim kit is available for purchase separately. We also CNC engraved : Center to center, Z, X, and "Square" (Y-X) measurements on this tool. Made of Aircraft grade aluminum for a lifetime of service. Buy a QRS shim kit and this tool and you will have a better aligned clutch system and a happy belt.